Liz Rueven and I first met on Instagram. While I don’t remember who contacted whom, and what the premise even was aside from admiring each other’s food pics, eventually we met face to face in 2016 in Haifa, where her husband has family roots. Since the meeting occurred around Hanukkah, I arranged for us a doughnut tour of the city’s bakeries. Along for the excursion was Liz and her daughter Elana, and we had a great time debating our preferences, analyzing subtle differences in filling-to-dough ratios and comparing exotic flavors to the gold standard—strawberry jam. Spoiler alert: We liked the classic varieties best. But as the food writer behind the popular farm-to-table blog Kosher Like Me, you’re much more likely to run in to Rueven at a farmers’ market than a doughnut shop. The market is, after all, where the Connecticut-based Rueven gets to know the seasonal produce and the farmers who grow them. 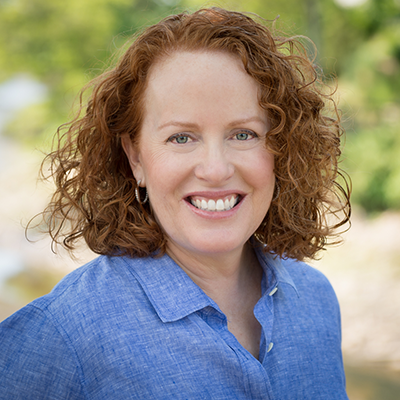 Rueven is an avid supporter of farmers’ markets and local small businesses, and even a board member of her local Westport Farmers Market. This shopping and meal-planning philosophy has taught Rueven to roll with the punches, recipe-wise, incorporating whatever is fresh and in season into her cooking. At the same time, her natural curiosity often leads her to try items recommended to her by vendors, produce she wouldn’t normally reach for. On a trip to California, she discovered cardoons, a celery-like thistle plant and relative of the artichoke that must be skillfully harvested and cooked to reveal its tender, rich insides. Broadcasting her findings on Instagram, her followers quickly jumped in to save the day with comments, tips and their favorite recipes for cooking the vegetable. The Hazon food conference, which many describe as “Jewish summer camp for foodies,” is a four-day gathering of Jewish food writers, community activists, farmers, teachers, rabbis and community leaders that takes places each summer at the Isabella Freedman Retreat Center and its adjacent Adamah Farm in the Berkshire Mountains. This year, Rueven was a co-chair of programing and moderated a discussion on the use of social media in the Jewish food world. Panel members included Shannon Sarna of The Nosher and The Modern Jewish Baker cookbook; Hadassah Magazine food writer and cookbook author Adeena Sussman; and Anna Hanau of Grow and Behold, a N.Y.-based Glatt kosher company that home delivers pastured meats. Rueven also presented a cooking demo during which participants learned how to turn out a delicious Shabbat lunch using nothing other than a knife and a vegetable peeler. 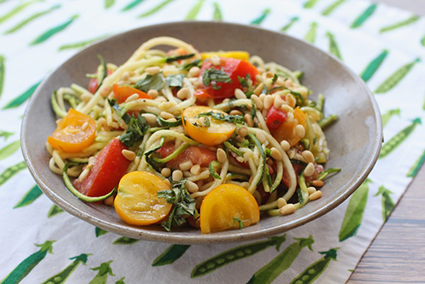 On the menu: Raw Zoodles with No-Cook Tomato Sauce and that golden plum salad, which she serves for dessert with a minty cardamom dressing. 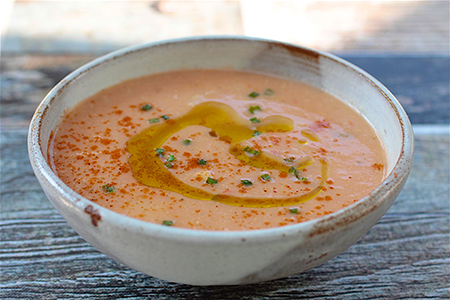 Both recipes appear below, as does this delightful summer corn soup. Make the stock: Place all ingredients in a large stock pot and cover with water that rises 2 inches above the vegetables. Simmer actively for 45 minutes to 1 hour. Cool and strain. Set aside for soup or stock. Make the soup: Heat olive oil and sauté onions over medium heat until transparent. Season with salt and pepper. Add chopped tomatoes and continue sautéing another 5 minutes. Add chopped potato, corn kernels, jalapeño (if using), 4 tablespoons of herbs and stock. Simmer actively, with lid cracked, for 30 minutes. Cool enough to handle and use an immersion blender or food processor with an S blade to blend. Some like it chunky, some like it smooth. Some like it hot. You decide. Add lime juice and stir. Taste for seasoning. Go for a balance of sweet with a bit of heat and citrus. This soup uses 8 cups of stock. Supplement your corn stock with an organic vegetarian broth. My soup was 50/50, corn stock to veg broth. This soup may be prepared 2-3 days ahead and/or frozen. 12 basil leaves, lightly chopped or torn. Reserve some for garnish. Trim ends of the zucchinis and spiralize into zoodles*. Place zoodles in a large bowl. Roughly chop the tomatoes and mix with garlic, basil, olive oil, salt and pepper in a large bowl. Dress the zoodles with the tomato sauce and toss lightly until well combined. Sprinkle with nutritional yeast and toss again. Taste for seasoning and garnish with toasted pine nuts and reserved basil. Tips: *Alternatively, use a vegetable scraper and using some pressure, scrape the zucchini into wide zoodles. If purchasing zoodles (no shame) buy (3) 10 ounce packages or the equivalent of about 7 cups zoodles. This salad is even better when it has time to rest. Consider throwing it all together in the morning (zoodle the night before) and allowing it to rest for 3-4 hours on the counter. Add cheese (if using) and toppings just before serving. When a friend told me she was baking chocolate cake to bring for dessert on a recent Shabbat, I immediately started to imagine which fruit would be interesting alongside it. Strawberries? Too expected. Blackberries? Too dark next to chocolate on the plate. 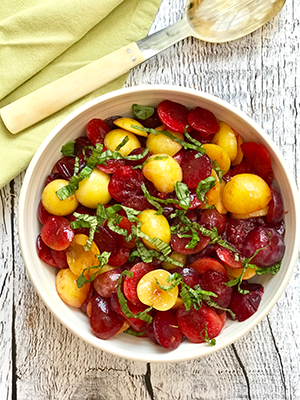 When I found these brightly colored plums at my farmers’ market I knew I had hit the jackpot. This recipe is pareve. Make it vegan by replacing honey with agave, but taste as you go as agave and honey are not the same flavor profile. Rinse and dry whole plums. Remove the pits and slice fruit in 1/8ths. Try to make your slivers relatively equal in size and work over a medium-size bowl so you catch all of the fruit’s juice. Dress the fruit with 1/2 the lemon juice, honey, cardamom, cinnamon and olive oil. Add pinch of salt, toss and taste. Add more lemon juice if desired. Toss with mint leaves and serve. Tip: This salad may be made up to one day in advance. If doing so, add mint leaves just before serving.